The most anticipated global FinTech event of the year is back! 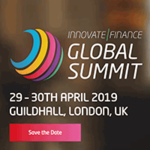 Now in its 5th year the annual Innovate Finance Global Summit is once again taking over London and the historic Guildhall for two days – Monday 29th – Tuesday 30th April. Bringing you all the hottest speakers and companies in technology, FinTech and finance, this year’s event is going to be the biggest and boldest yet! Expect over 2000 attendees, 300 FinTech companies and 200+ speakers! IFGS will also kick off the official UK FinTech Week, running from Monday 29th all the way to Friday 3rd May, bringing together the brands, businesses and decision-makers fuelling the FinTech revolution.